You may have heard of the term VPN but you haven’t really gotten yourself to take a closer look as to what it is. Well, if you consider today’s ongoing threats with regards to online privacy, then you might as well take the necessary precautions. Needless to say, connecting to a VPN can help secure your browsing activity. Speaking of which, let’s find out more about the features and functions of SurfEasy. SurfEasy is a cross-platform VPN client. In other words, it can work on various platforms such as Windows, Mac OS X, iOS 6 and Android 4.0. 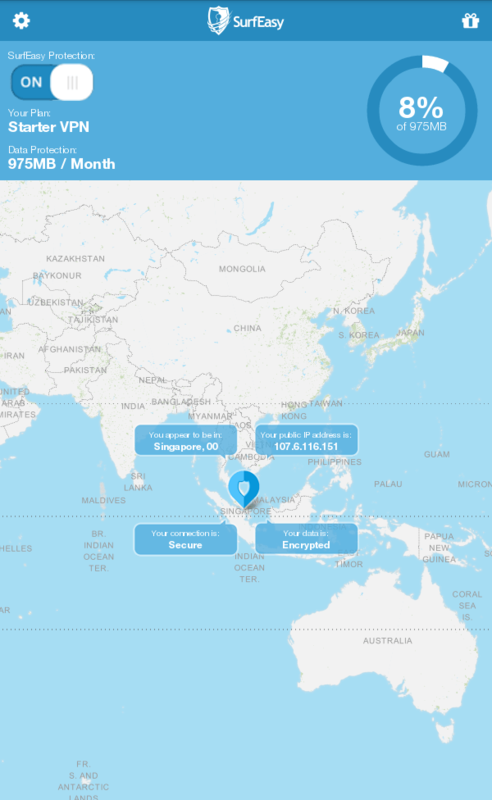 Just like other VPN clients, SurfEasy is designed to protect your online privacy as it secures your Internet connection on various Wi-Fi hotspots and other unsecured networks. Other than this, you can also use this VPN client to hide your real IP address. This way, you can browse the web anonymously without allowing others to find out about your real identity or track your actual location. Anyways, this review will focus more on features and functionality of SurfEasy for Android. Considering the fact that there are plenty of VPN clients in the market, SurfEasy has a lot of distinguishable features that one simply can’t ignore. First and foremost, its VPN service is not just limited to Android. It’s a cross-platform VPN client so you can use it on your iPad, iPhone, PC and Mac. That’s not all. This secure VPN client also flaunts a modern and responsive user interface. With SurfEasy, free users can enjoy up to 500MB of data without limits in surfing speed. Compared to other mobile VPN clients, it’s very fast plus it’s free of annoying glitches and errors. Another thing that I like about this VPN service is that it is generous enough to offer various ways to increase your data limit. Say, for example, you can get up to 50MB of additional data by simply following its official account on Twitter. You can also connect and share your SurfEasy account across multiple devices. To start using this VPN client on your Android device, you simply need to create an account by providing your email and password. After that, SurfEasy will automatically connect you to one of its secure VPN servers. This also means that it can automatically mask or hide your real IP address. If you want to change the region that you’re connected to, just swipe the app’s screen to the right and tap “Select Region”. After that, just tap the country that you want from its list of available regions. Wait until your new connection has been successfully established and that’s it. You’re free to browse the web anonymously. You can even use this client to watch videos that are usually blocked or restricted in your region. To sum it all up, I can confidently say that SurfEasy is one of the best VPN clients for Android. What I like most about it is that it gives its users the freedom of choice. So even if you continue using the VPN client as a free user, you won’t feel obliged to upgrade just because the app has restricted your access. Anyways, I don’t really have any serious issues or concerns regarding this app. I just find it a bit disappointing that it lacks support for landscape mode. 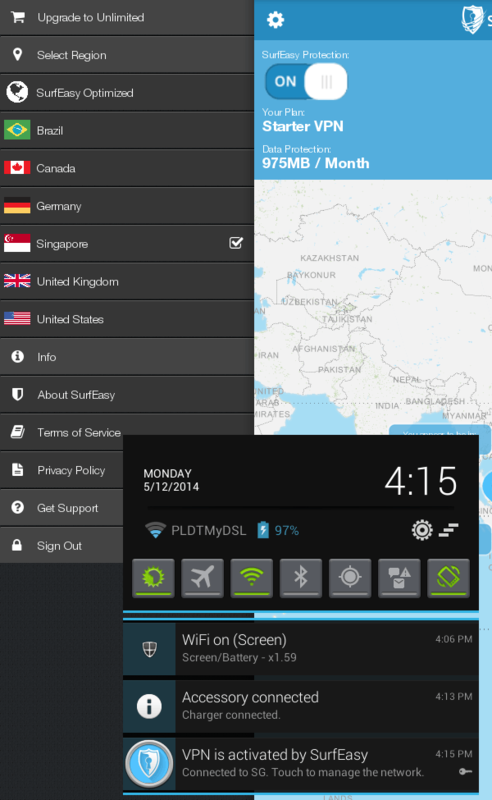 If you’re looking for a fast, secure and reliable VPN client, I highly suggest that you try SurfEasy for Android. As a free user, you can start with 500MB of data which you can immediately use for anonymous web browsing and online streaming. Apart from this, you can also connect your account to other devices. This way, you can easily extend your anonymous browsing sessions to your PC, laptop, Mac, iPad and iPhone. So go ahead and check it out.